First, why the title? 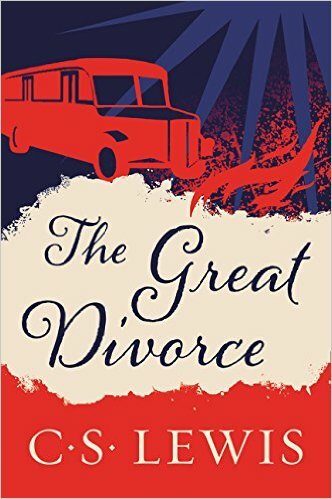 Lewis's fictional satire is not about either marriage or divorce. Lewis himself tells us that the title is a response to the title of the Romantic poet William Blake's much shorter poem The Marriage of Heaven and Hell. Blake's view of heaven and hell was far from Christian; however, unthinking readers of C. S. Lewis may think the same about The Great Divorce - if they miss the fact that C. S. Lewis is showing indeed the metaphorical "great chasm" between heaven and hellish human nature. 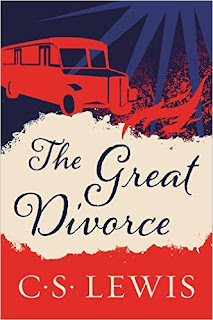 We need to use the same imaginative caution in reading The Great Divorce. Here are some examples from the plot. If we were to visit heaven, we would not take a bus - but we might find the experience very like the impersonality of public transportation if we were not spiritually ready for it. Similarly, we would not find the grass literally too sharp for our feet - but there is something uncomfortable about heavenly reality when we want to treat this world as if it is heaven. Finally, and obviously, souls in hell do not get a chance to visit heaven, but - and this is Lewis's main point - if they did, they could not stay there, because their unredeemed nature could not stand heavenly blessings. Again, Reformed Christians may find this upside down. Isn't it God in His holiness who could not tolerate us in heaven? True, but Lewis is using this bus trip to heaven to show exactly what is so offensive about our sins - how even qualities that we consider commendable, like a mother's love or the need to give God our best work, may be instead evidence of egoism or selfishness. Lewis memorably depicts how sinners cling to such seemingly virtuous sins; however, he also shows the beauty of the glory arising when more obvious sins as lust being torn from our souls - like a pet lizard being ripped off your shoulder. The removal of lizard lust will remind many readers of how Eustace lost his dragon skin in The Voyage of the Dawn Treader. More importantly, Lewis shows how all spiritual growth involves the gouging out of the right eye or the cutting off of the right hand that troubles us (Matthew 5:27-30), or the dying of the old nature that the Heidelberg Catechism speaks of. If only to show that the Christian life involves painful but rewarding struggle against our own sinful nature, this is a book everyone should read.